Corsair introduces the Air Series Fans, which includes a total of five fans. It includes the High Airflow series for large-volume cooling, with the 120mm AF120 Quiet (39.88CFM / 21dBA), the 120mm AF120 Performance (63.47CFM / 30dBA) and the 140mm AF140 Quiet (67.8CFM / 24dBA). 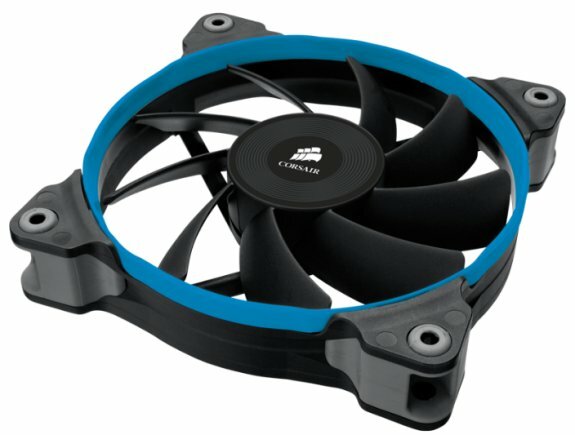 For efficient cooling on radiators and heatsinks, Corsair has two 120mm High Static Pressure fans. It includes the SP120 Quiet (37.85CFM / 23dBA / 1.29 Static Pressure (mmH2O)) and the SP120 High Performance (62.74CFM / 35dBA / 3.1 Static Pressure (mmH2O)). Corsair®, a worldwide designer and supplier of high-performance components to the PC gaming hardware market, today announced the new Air Series™ line of PC cooling fans. Unlike most other PC fans in the market, Corsair Air Series fans are offered in airflow and static pressure models, each specifically optimized for specific PC cooling roles. Air Series fans are designed to deliver an extraordinary balance of airflow and low-noise to users who want to upgrade their PCs for quieter operation or higher performance. All feature an advanced hydraulic bearing system and rubber mounts for low-noise and reliability, and include red, white, and blue color rings to allow users to customize the look of their PC. Air Series AF120 and AF140 airflow fans are designed to intake cool air into, and exhaust hot air out of, modern PCs. They are for ideal for mounting on the side, top, and rear of cases, to reduce component-killing heat. The airflow fans are designed with ultra-thin, custom-molded blades optimized to flow high volumes of air in unrestricted spaces with at least 3cm of clearance. They are available in a 140mm Quiet edition and in 120mm Quiet and Performance editions. Air Series SP120 fans deliver focused air pressure in situations where air needs to be blown through a restricted space making them ideal for cooling radiators and heatsinks. They feature seven ultra-wide, custom-molded blades and a custom enclosure that delivers high static pressure, while maintaining a quiet noise profile. Available in a 120mm size, SP120 fans are available in Quiet and High Performance editions. "Many PC fans on the market are general purpose designs that not always suited to the task which they're assigned," said Ruben Mookerjee, VP and General Manager of the Components Business Unit at Corsair. "We took our expertise in PC case and cooling and designed fans that have very specific uses. Each fan is the right tool for the right job." Air Series fans are immediately available starting at a suggested retail price of $16.99 USD for AF120/SP120 fans and $18.99 USD for AF140 fans. For more information on Air Series fans, please visit the cooling section of our web site and our Air Series fan blog post.